Need more information about booking Home 7288996 ? This is a large apartment of 120 sqm surface ,, spacious, clean and in excellent condition, with a terrace, furnished and well equipped, offering 4 rooms: 3 rooms and a lounge. It is the raised ground floor of a modern building, located opposite the Arrisala private school in Nador Al Jadid, in the Hay Al Matar area, it is near the sea and the city center (about 7 minutes by car). 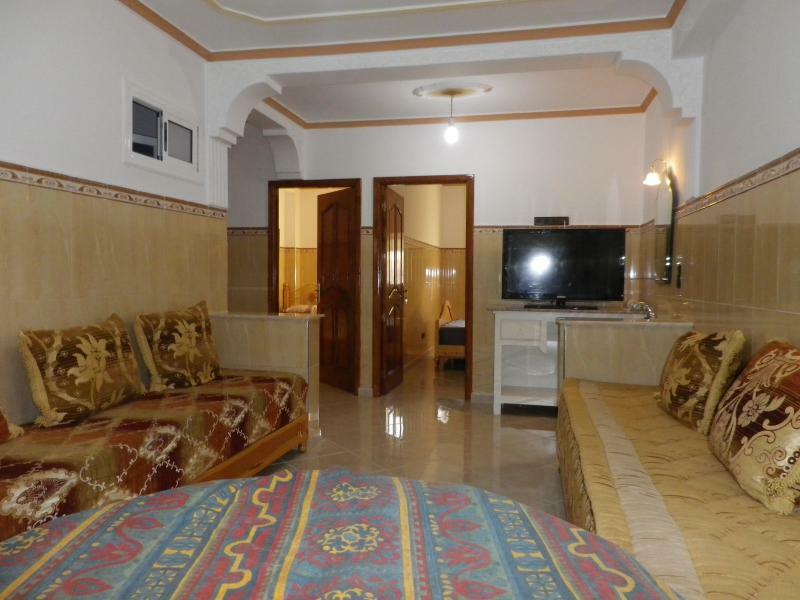 Facilities: TV - Satellite, utensils, oven, microwave, apparatus for juice ... A washing machine, gas heating. You can get in touch with HAKIM (the owner) through the contact form on this page. Send HAKIM (the owner) an email through the contact form on this page. Alternatively, if there’s a phone number on this page, you can call them. How do I contact HAKIM (the owner)? If you’ve already booked, go to Manage your holiday booking to view HAKIM the owner's contact details or send them a message. Or send HAKIM (the owner) an enquiry through the Contact the owner/manager form if you’d like a quote or more info first. When you pay online through the Book your stay form, a booking request is sent to HAKIM (the owner). You’ll find out within 24 hours whether they’ve accepted - no money will leave your account before then. You can also request a quote from HAKIM (the owner) through the contact form. The owner will email you the total cost for your dates and a link to book and pay online. Use the Book your stay form to pay provisionally online. You can pay by credit/debit card or PayPal. HAKIM (the owner) will have 24 hours to accept the booking and no money will leave your account before then. Why can't I call HAKIM (the owner) before booking? You’ll need to contact HAKIM (the owner) to do this. Send them a message in Manage your holiday booking or through the contact form on this page. You can request to change the dates or number of people on your booking via the Manage your holiday booking page. To change your holiday dates use the Edit booking button. If you need to change the number of guests staying then send HAKIM (the owner) a message. If HAKIM (the owner) agrees, they’ll send you a revised quote outlining the changes. You can review and accept/decline this from the Manage your holiday booking page. You’ll have 48 hours to take action before the revised quote expires.